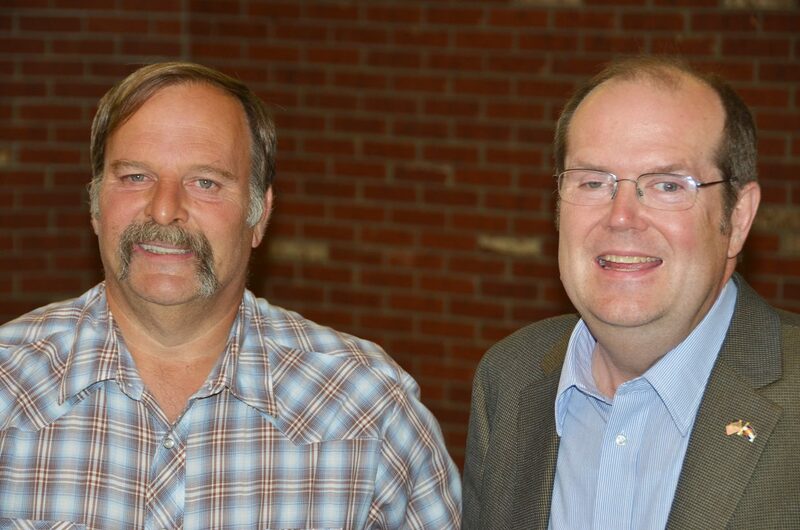 Moffat County Commissioner candidates Tom Soos, left, and Frank Moe stand together after an hour-long candidates' forum held at Centennial Mall on Thursday night. Both men are vying for county commissioner District 3 in the primary election under the Republican ticket. Whoever wins the primary vote will move onto the November ballot. Craig — Candidates for Moffat County commissioner went head to head in a forum Thursday night. Frank Moe, owner of the Best Western Deer Park Inn and Suites, and Tom Soos, emergency management coordinator for Moffat County, are running against each other for the District 3 Moffat County commissioner seat that Tom Mathers currently holds. The two got a chance to present their stances on local issues at the forum hosted by the Craig Daily Press and KRAI 93.7 FM and 55 Country. Moe and Soos answered a handful of questions from the newspaper, radio station and community about their interest in the commissioner position. “This is a challenging assignment, and I am up for this challenge,” Moe said. He highlighted his business experience and his advocacy for the county, including testifying on behalf of traditional energy and coordinating the effort in 2012 to bring former presidential candidate Mitt Romney to Craig. Soos, who has worked under various county commissions since he started his position seven years ago, brought up his experience within the county and the work he’s engaged in with different boards. The two candidates had a number of ideas about how to boost the economy. Moe said he wanted to continue to advocate for traditional energy at the state level and empower the existing programs that help businesses while Soos outlined diversification. He would work with the Craig/Moffat Economic Development Partnership and the Marianna Raftopoulos Business Incubator to help local business, he said. “I would be working more to make them accountable and successful,” he said. Soos said he would focus on energy and job diversification. “One of the greatest economic issues we have is that Moffat County is in a (energy) boom-bust cycle,” he said, adding that the county also needs to diversify. One way to do that would be by focusing on agricultural issues, Soos said. Both candidates said they would protect private property and water rights, while keeping the community as a whole in mind. “Property and water rights are property owner rights and need to be protected,” Soos said. When it came to the county’s decision to put a moratorium on the sale of recreational marijuana, the candidates had slightly different takes. Moe said he agreed with the current commission’s plan to wait until after the primaries to sift through three ideas: to lift the moratorium, put the question on the November ballot or keep the moratorium. “I support what they have done,” Moe said. Soos focused on the voters. The candidates were asked how they might boost health care and education in Moffat County. On the issue of health care, Moe said the county should base its system on effective health care models in other counties. “Rural health care has challenges. Most of the challenges are not unique to Moffat County,” he said. Soos largely focused on health care issues and needs of senior citizens, stating that the county must cater to their needs so they don’t go elsewhere for medical care. Each candidate had 90 seconds to answer each question. By the end of their 90 seconds on the health care and education question, neither got to education. Both candidates had two minutes to summarize why they want the District 3 Moffat County commissioner seat. Soos said the county was approaching a state of crisis. Moe talked about goal setting. Voters will decide which candidate makes it onto the November ballot during the primary election. Both are Republicans, and only one will make it to the next stage. The county sent out mail ballots June 2. Residents also can vote in person June 24. Other candidates who were running uncontested issued statements to the public during the forum. Linda Peters, running for Moffat County treasurer, and Chuck Cobb, running for Moffat County assessor, both highlighted their decades of experience in related fields and promised to dedicate themselves to helping the county through their respective offices. KC Hume, running uncontested for Moffat County sheriff, said he wanted the position so he could give back to his hometown.